This year, we’ve learned that there’s nothing more fantastic than pasture-raised, non-GMO-fed turkeys from your own homestead! Now that we have all this amazing meat though, what do we do with it? Well, it occurred to me today that I could try for a series of blog posts here about how we’re using this precious commodity. Of course, we had to fix our first turkey in the traditional way. 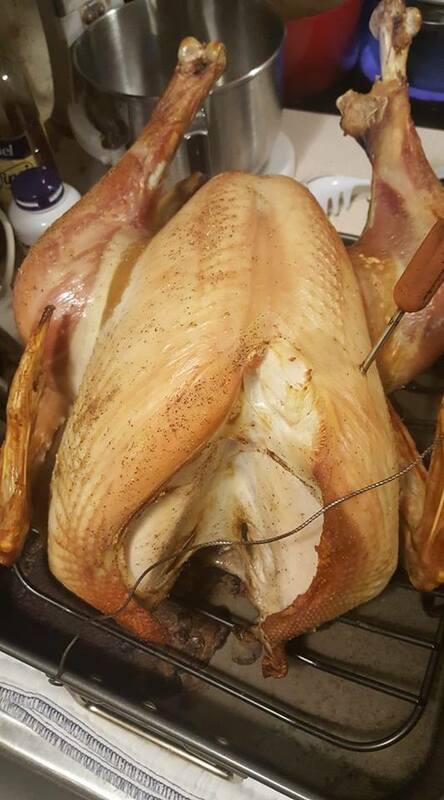 I brined a turkey that weighed almost 19 pounds, and I roasted it in my favorite roasting pan. It was delicious! In fact, it was so good that we had a repeat of day 1 with leftovers the next day. Using a huge leg quarter from the day 1 turkey, I decided I was going to make turkey and noodles. The end result didn’t turn out anywhere near the way I expected though. I put the leg quarter in my enamel-coated cast iron pot, and I covered it with filtered water. Then I simmered the leg quarter for about three hours. I removed the leg quarter, pulled the meat off the bone, and I set the meat aside. I placed the bones in a bag to save for later, and I brought the liquid in my pot to a boil. I added a package of egg noodles, and I cooked them ’til they were just done. After the noodles were cooked, I put the turkey back in the pot, and I added some green beans from “day 1” that I thought I’d ruined. (On Saturday, I had cooked green beans in a crock pot with bacon, red onion, garlic paste, salt, and pepper, but there was something about the taste that I didn’t love. Since I didn’t want to waste them, I put them in the fridge thinking I could salvage them.) I simmered the whole concoction for another ten or so minutes, and like magic, I had the most amazing turkey and noodles I’ve ever eaten! They were SO good! I might not be able to do turkey twenty ways from just one of the homestead turkeys, but so far, the degree to which I’ve been able to stretch this first turkey is looking very promising. This entry was posted in Blogs and tagged turkeys. Bookmark the permalink.